Newfield is hard, that’s a hard one, you can’t do too much of that. Sam Newfield is, in all probability, the most prolific director in American sound-film history, but very little archival material survives on his career. The director of more than 250 feature films, as well as numerous shorts and television series episodes, in a career that spanned four decades, from 1923 to 1958, Newfield leaves behind him only his work on the set; next to nothing is known of his personal life. However, using conversations with Sigmund Neufeld, Jr., and Stanley Neufeld, the sons of Sam Newfield (born Neufeld)’s brother Sigmund Neufeld (all quotes from them in this essay are from these interviews), as well as materials from the Margaret Herrick Library of the Academy of Motion Picture Arts and Sciences in Los Angeles, I was able to piece together a rough sketch of the man behind such a torrential output of work. Comedies, musicals, westerns, horror films, jungle pictures, crime dramas, espionage thrillers – Sam Newfield did them all, often on budgets of less than $20,000 per feature, and shooting schedules of as little as three days. But, as Martin Scorsese notes, watching Newfield’s work is hard, because he often seems absolutely detached from the images that appear on the screen, as if he is an observer rather than a participant. Then, too, the conditions of extreme economy that Newfield laboured under created a pressure-cooker environment in which the ultimate goal of all his films was simply to get them done on time and under budget. Nevertheless, as arguably the most prolific auteur in American motion-picture history, Newfield deserves mention and brief examination as one of the key “second-rung” directors of 1940s Hollywood, Newfield’s most productive era. Born on 6 December 1899 in a cold-water flat in the Bronx to immigrant parents from Budapest, Sam Neufeld was one of four children. His older brother, Sigmund Neufeld, Sr., was born in 1896 and, with the premature death of his father, Simon Neufeld, Sigmund rapidly became the family’s sole source of income. Sam and Sigmund’s other brother, Murray, became an electrician, while their sister, Sadie, eventually married a “grip” in the 1920s and settled down to life as a housewife and mother. But all of this was well in the future when Sigmund was forced to drop out of school in the sixth grade after his father’s sudden death, and at the age of 11 got a job delivering beer to New York saloons with a horse and wagon. Other jobs rapidly followed in succession and Sigmund learned to hustle to support his indigent family. Sigmund’s father, Simon, had been a “picker” in the fur business, taking scraps of fur left over from bigger jobs and preparing them to be sewn together in cheaper fur coats. However, endlessly toiling in poorly ventilated workshops left Simon susceptible to a variety of ailments, and his early death from pneumonia made Sigmund wary of following in his father’s footsteps. Instead, while Sigmund’s mother eked out a meagre living washing floors of the cold-water tenements in the building where they lived, young Sigmund developed a reputation as an aggressive entrepreneur, who saw early on that he would have to take chances in order to survive and advance. Fired from his beer delivery route, Sigmund delivered newspapers, sold fruit on street corners, and finally got a job as a delivery boy for a local tailor and dry cleaner. One day, Sigmund was sent to drop off some clothes for the head of Universal Pictures’ New York office and was immediately entranced with the hum of creative activity. Sigmund refused to deliver the clothing to anyone other than the head of the company and, as a reward for his persistence, was hired in 1914 as a go-fer, runner and general assistant, and then rapidly advanced to the cutting room. The job for the tailor was immediately forgotten; Sigmund Neufeld had found his life’s work. Sigmund’s driving ambition inspired his brother Sam to try his luck in the film business, as well, although for the moment Sigmund remained the family’s chief breadwinner. By the late teens, Sigmund was asked to go out to California to Universal’s studios there and supervise the editing of two-reel comedies made by the Stern Brothers production company, but released through Universal. By now an experienced editor, Sigmund saw that there was considerable wastage in the shooting of the comedies, and impressed his bosses when he managed to put together a “new” two-reel film from outtakes and unused scenes of two or three comedies, creating more product, and profit, for his employers. For each “extra” comedy Sigmund manufactured for the Stern Brothers, Sigmund would get a modest bonus: on one occasion, he got a diamond ring for his efforts, now worn by his son Sigmund Neufeld, Jr. But the young Sigmund Neufeld noticed that, while he might get a little something extra for his efforts, his bosses pocketed a cool $10,000 for each “instant” comedy Sigmund stitched together. Thus it was that, after a few desultory stabs at directing, Sigmund decided to make a move to production, so that he could reap the full benefits of his labour. Sigmund was still the main source of support for his mother, two brothers and sister, sending money back home to New York at regular intervals to keep his family solvent. One by one, his family members joined him in Los Angeles. The first to follow his brother west was Sam, who changed his name to “Newfeld” and later “Newfield” as he climbed up through the studio hierarchy on his way to the director’s chair. Starting off in the industry in 1919 as a runner, set assistant and occasional actor, as his brother had, Sam soon found that he had a knack with actors and enjoyed working on the studio floor, much more so than Sigmund, who was increasingly drawn to the business and production end of the business. Rapidly moving up through the ranks at the Stern Brothers Company thanks to his brother’s influence with the front office, Sam Newfield directed his first silent film in 1923. Later silent films included Which is Which? (1926) as part of the Excuse Makers series, and comedy entries in the popular Let George Do It, What Happened to Jane and Buster Brown series. For the Jane series, Newfield directed Jane’s Predicament (1926), Jane’s Engagement Party (1926), Jane’s Sleuth (1927) and other titles; his Let George Do It entries included Sailor George (1928), George’s School Daze (1928), George’s False Alarm (1928) and many others; and for the Buster Brown series Newfield’s films included Buster Trims Up (1928), Buster Minds the Baby (1928), Busting Buster (1928) and numerous other comedies. In all, between 1926 and 1930 Newfield directed more than 50 two-reel comedies, learning the ropes as he went along. This in itself would be enough for mention in any comprehensive film history, but, as it turned out, Sam Newfield was just getting warmed up. Making these films on very rapid schedules and tight budgets, Newfield consolidated his reputation as a fast and conscientious craftsman, so busy, in fact, that he began freelancing for the bottom-rung outfit, Educational Pictures, on additional two-reel shorts while still working full-time for the Stern Brothers at Universal. However, the landscape of the industry was changing. By 1930, sound had definitively arrived in Hollywood and, while Sam made the switch to talkies with relative ease, the market for shorts was beginning to stagnate. The Stern Brothers company was absorbed by Universal, but Universal saw no reason to promote either Sam or Sigmund out of its two-reel comedy unit, which was arguably the lowest rung of the studio production ladder. With no opportunities for advancement, Sigmund struck out on his own as an independent producer. At first, the going was tough, and Sigmund had to scrimp and economize to produce his early programmers, such as The Red Haired Alibi (1932, directed by Christy Cabanne) and Red Blood of Courage (1935, directed by John “Jack” English, who would later become a prolific co-director of action serials for Republic Pictures, working with the gifted William Witney for most of his career). Sam Newfield, oddly enough, didn’t work for his brother in his new producer capacity during this period, and he struggled to get his first feature assignment, Reform Girl, followed by The Important Witness and Under Secret Orders, all shot in 1933. But the films were successful and Sam pressed on. In 1934, he directed four independent features, Big Time or Bust, Marrying Widows, Beggar’s Holiday and African Incident, all modest but successful program pictures. By 1935, Sam had established himself as a reliable second-rung director and brother Sigmund had partnered with Maurice Conn to create Ambassador Pictures, a small production company specializing in Westerns and outdoor-action fare. For Ambassador, Newfield directed Northern Frontier, Code of the Mounted and Trail of the Wild, all in 1935, and it seemed as if the partnership between the two brothers might extend profitably in the future. 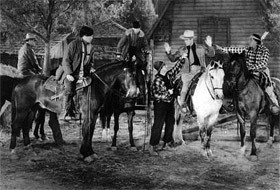 But for the next few years, while Sigmund produced a slate of routine Westerns, Sam went over to Republic to grind out Johnny Mack Brown and Bob Steele Westerns on an assembly-line basis, switching to Sam Katzman’s tiny Victory Studios in 1939 to create a similar series of Tim McCoy Westerns, all made on modest budgets. Sam clearly liked Westerns more than almost any other genre and, while the production values of many of these programmers were obviously threadbare, all of the films returned a tidy profit. However, events would soon conspire to bring the two brothers together under the roof of the same studio, Producers Releasing Corporation, where, for better or worse, they embarked on the most productive – some might say notorious – period of their long careers. PRC itself came about through the collapse of Producers Distribution Corporation, or PDC, which was originally set up by Poverty Row producer Ben Judell. Working with Sigmund Neufeld as his co-producer, and Sam Newfield as the director, PDC produced a relatively ambitious anti-Nazi film, Hitler: Beast of Berlin (1939), featuring, in a bit part, a very young Alan Ladd. The film was topical, reasonably budgeted in the $100,000 range, but it ran afoul of the German American Bund, then quite active in isolationist pre-World War II America. The Bund members broke into the PDC lot and destroyed the film’s sets almost entirely. They were rebuilt, but then local censorship boards refused to pass the film for exhibition because of its “anti-German” slant. With many distribution possibilities blocked, production bills began to pile up. With six additional features in production, Judell was seriously over extended and PDC collapsed in a hail of debts. Sigmund Neufeld, however, sensed an opportunity and, working with Robert S. Benjamin, an attorney for Pathé Film Laboratory, one of PDC’s chief creditors, he forestalled payment of a $90,000 debt to Pathé in return for a stake in the reorganized PRC. (1) Judell was out, Sigmund Neufeld was in, and he lost no time in signing up his brother Sam as PRC’s house director, who would single-handedly helm the majority of the company’s feature output from 1940 up until the demise of PRC in 1947. Indeed, Newfield was so prolific that he became something of an embarrassment to the fledgling studio and, on the advice of his brother, Newfield adopted two aliases, Sherman Scott and Peter Stewart, to cover his tracks. Sigmund Neufeld, Jr., told me that, while these pseudonyms are now fairly common knowledge, at the time of their implementation they were a closely guarded secret. PRC’s New York office, in fact, called Sigmund in for a meeting, telling him that while Sam’s work was good, and Sherman Scott’s work was also acceptable, Peter Stewart was the real “find” for the studio and that Sigmund should use him more often in the future. Sigmund cheerfully complied with this directive and Sherman Scott’s output declined, while Peter Stewart’s escalated. It has been written that Newfield used these aliases on a “genre” basis – using “Newfield” for Westerns, “Scott” for crime films and “Stewart” for more serious dramas – but there seems to be little foundation for this. 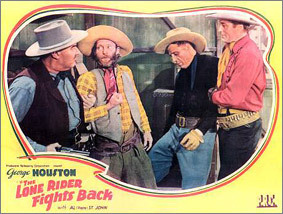 “Scott”, for example, directed Billy the Kid’s Fighting Pals (1941), while “Stewart” directed Billy the Kid in Texas (1940), and Newfield directed The Lone Rider Fights Back (1941) under his own name. Further, Newfield abandoned this “triple threat” strategy early in 1943 with only one exception (1946’s The Flying Serpent, which he directed as Sherman Scott) until PRC itself collapsed, and Newfield began the final phase of his career, freelancing for William Pine and William Thomas (known as “The Dollar Bills” for their unflagging production economy) at Paramount, and producer Maurice Conn at 20th Century Fox, one of Newfield’s few brushes with a major studio. 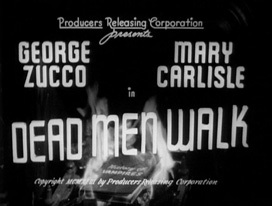 In these films, Newfield alternated between his alter egos with seeming impunity, until in 1950, working for Robert Lippert’s cost-conscious production company, Newfield abandoned the practice altogether and was billed solely as Sam Newfield from 1950 to 1958, when he directed his final films. But all this was in the distant future when Newfield assumed the key directorial reins at the newly minted PRC, and began turning out product at a torrid pace. Obviously, Newfield wasn’t the only director on the PRC lot. Edgar G. Ulmer, whose films have since been recognized as some of the most interesting and influential genre films of the 1940s, was PRC’s “prestige” director. Ulmer himself referred to his position with the company as being “the Capra of PRC” (2), and such films as Detour (1946), Bluebeard (1944), Strange Illusion (1945) and Her Sister’s Secret (1946) have long since developed a cult status among aficionados of 1940s Hollywood cinema. Even so, Ulmer had minimal resources to work with: a strict schedule of five or six days per feature, a 2 to 1 shooting ratio and an average of sixty or more camera set-ups a day. Indeed, Ulmer adopted a style of shooting the close-ups in his films for PRC against a neutral grey background to disguise the fact that they were shot back-to-back, for all the day’s scenes, with one set-up in the final hour of shooting every day. Ulmer would direct the actors to look “camera right” or “camera left” as they read off dialogue from all the day’s sequences, and put his hand over the lens to separate the takes. (3) Such draconian economy did not come naturally to Ulmer, who had been used to the relative production luxury of such films as Universal’s The Black Cat (1934) earlier in his career. For Sam Newfield, such tactics were an everyday occurrence. This, of course, is the most problematic factor of Newfield’s films for PRC; with so little time and money at his disposal, and the bottom line always strictly enforced, Newfield had no time for delicate touches in his work. Newfield’s many Westerns are straightforward and violent, with a minimum of character development; his big-city dramas, such as Queen of Broadway (1943), and his horror films, in particular Dead Men Walk (1943) and The Flying Serpent (1946), are grimly procedural, moving with inexorable assurance towards their generically predestined ends. The Black Raven (1943), a crime drama set in a rundown inn, is unrelentingly bleak and fatalistic; I Accuse My Parents (1944), an early juvenile delinquency film, foreshadowing Nicholas Ray’s later Rebel Without A Cause (1955), offers a similarly grim view of wartime absentee parenthood and its social consequences. Swing Hostess (1944) is a typically cheerless PRC musical, simultaneously tacky and tawdry, while Murder Is My Business (1946) is a grimy crime thriller that embraces its shoddy world with world-weary certainty. The pace of production was unrelenting. In 1943 alone, Newfield directed no less than eighteen feature films; in 1945, twelve films; and, in 1946, 15 full-length features. On the set, Newfield preferred to shoot long master takes with few close-ups, making his master shots the key coverage of his scenes. Close-ups were reserved for detailed action – a door opening, a gun firing, a safe being cracked – and thus Newfield’s films have an air of hermetic finality in their execution which is, for better or worse, his alone. One gets the feeling that Newfield’s actors do not so much appear in his films as they are trapped in them, entombed in their frames for cinematic eternity, consigned to low-budget limbo, inhabiting a shadow zone of hastily constructed sets and borrowed narratives. Indeed, one of Newfield’s most controversial projects is his “riff” on Billy Wilder’s Double Indemnity (1944), which he directed as Apology for Murder (1945); the original title of the project, amazingly enough, was Single Indemnity. Paramount, Wilder’s home studio, wasn’t fooled by the title change and slapped an injunction on the finished film, which remains in force to this day. Although it is an interesting and often effective thriller, Apology for Murder survives only in private collections and on bootleg DVDs, and is seldom if ever screened in public. At the same time, Newfield was an inveterate gambler, whose gaming habit eventually got the better of him. Even in his early PRC days, he would get a crap game going during breaks, or in the studio bus on the way to Iverson’s Ranch to shoot one of his Westerns, or at the end of the day as production wound down. Newfield loved any sort of wagering, and in one case matter of factly informed the cast and crew on one of his films that, whatever happened, he had to finish the day’s shooting by 3 o’clock so he could get to the Santa Anita racetrack in time to see a heavily favoured horse – whom he had backed to the hilt – run in the day’s final race. Sadly, it was this affliction more than anything else that marked Newfield’s personal decline in his last years; estranged from his wife, the former Violet McComas, whom he had met as a script supervisor on one of his films, Newfield lost custody of his children, Joel and Jacqueline, in a bitter divorce case and never really recovered from the aftermath of the affair. But these events, mercifully, would be confined to his final days; for the moment, in the early 1940s, Newfield was at the top of his game, the purveyor of the cinematic Blue Plate Special in genre-driven Hollywood. For someone who made so many films, it’s both interesting and intriguing that Newfield kept no scrapbooks, photo albums or other mementos of his career, and that today there are only two known photos of Newfield in existence – an astounding fact for the most prolific director in the history of the American sound cinema. While gregarious, Newfield never sought out publicity and was happiest on the set, working on one project after another, taking each new script as a fresh challenge. As he consolidated his hold on PRC’s top directorial spot, Newfield gathered around him a crew of skilled technicians whom he could rely upon to knock out the day’s work with speed and efficiency. 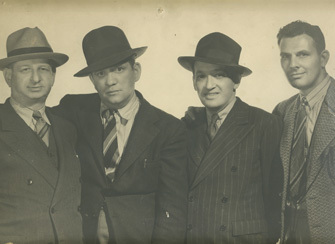 In one of two known photographs of Newfield, he appears with his brother and the two key members of his crew at a formal studio dinner at PRC in the early 1940s. From left to right, Bert Sternbach, the studio’s ace production manager, staring at the camera, is flanked by Newfield himself, his eyes confronting the viewer with an inscrutable and impassive gaze, next to his brother, Sigmund, every bit the hard-edged businessman, and Jack Greenhalgh, a rough and tumble cameraman of legendary speed and efficiency. My first reaction in seeing this photograph (which was also my first view of Newfield himself) was a sense of shock; here, unmistakably, was Hollywood’s working class, completely aware that they were creating genre entertainment for mass audiences at a price, and utterly unapologetic about their films or their production methods. Unlike many directors, Sam Newfield felt most comfortable making straightforward films for audiences eager for 60 to 70 minutes of cheerfully brutal entertainment. Newfield and his crew were, as the photo attests, tough customers, uninterested in theorizing or pushing back the limits of genre filmmaking. But at the same time, because of the inherent hardscrabble desperation implicit in all PRC films, Newfield and his colleagues ultimately presented a truer picture of 1940s America than many of his slicker compatriots at the major studios. At PRC, it was a constant fight to find story material, hire actors at cut rates, recycle sets from existing flats and then push through 40 to 50 set-ups a day to get the finished film in the can. PRC was involved in a continual struggle for mere survival on an everyday basis, much like the rest of the country during World War II. Sam Newfield and his crew were populist filmmakers, who never condescended to their audiences and yet never stretched the limits of genre filmmaking, either. Life in the 1940s was hard; life at PRC was hard. Unlike studio life at the majors, from MGM on down, where luxury and privilege were a way of life for many of the studio’s most valuable players, at PRC everyone from the top down worked for their living. As Sigmund Neufeld, Jr., told me, “I think they were happy where they were. My dad and Sam both realized that they were doing what they were really good at.” In short, at PRC the quotidian struggle for survival was real, both on and off the screen. PRC was, in the truest sense of the word, a “mom and pop” operation, since between them Sigmund and Sam pretty much ran the studio, although Leon Fromkess, a former accountant from New York with a degree from Columbia University, was the titular head of the organization; before Fromkess, until 1944, O. Henry Briggs served as PRC’s financial head, but ultimately he clashed with Sigmund Neufeld and resigned. The division of labour was fairly straightforward; Sigmund, always more of a “roll up your shirtsleeves” type, kept an eye on daily production, supervising the activity on PRC’s eight soundstages throughout the day. Fromkess supervised finance, and kept the distributors and film exchanges from interfering too much in production. Indeed, shortly before PRC dissolved, Fromkess left the company to join Samuel Goldwyn’s much more prestigious organization, working with Goldwyn on William Wyler’s The Best Years of Our Lives (1946) and Henry Koster’s The Bishop’s Wife (1947). But, as we’ll see, Fromkess was soon restless at the Goldwyn studios and left to set up his own production company, where his path would again cross with Sam Newfield on a number of projects. Another aspect of PRC’s studio identity was the fact that, during the run up to World War II, both Sigmund and Sam felt strongly that Hollywood had to oppose the Nazi régime in Germany, as evidenced by their first project, Hitler: Beast of Berlin (aka Goose Step in re-releases). In their rejection of Nazism, PRC was ahead of the curve in Hollywood, as the major studios still sought to appease Hitler and thus avoid the loss of film rentals in the lucrative German market. Only Warner Brothers, arguably the most socially conscious studio in the 1930s and early 1940s, followed PRC’s lead, with the production of Anatole Litvak’s Confessions of a Nazi Spy (1939), when the rest of the majors advised Warner’s to avoid the subject. But PRC served another function in the battle against Hitler. Though neither Sam nor Sigmund were particularly religious, the studio soon became an informal haven for many gifted Jewish artists escaping from the Nazis, such as Edgar G. Ulmer, Franz Wysbar (who “anglicized” his name to “Frank Wisbar”) and the brilliant cameraman Eugen Schüfftan. And yet, like most of the minor studios, what most defined PRC was a strong work ethic, shooting from dawn to dusk six days a week to get the film in the can on time. There was another factor to consider: unlike the major studios, PRC never sold its films on a percentage basis to theatres, but rather as straight rentals. Most PRC films played the bottom half of double bills. If a PRC film was an unexpected box-office hit, the theatre owners, not PRC, reaped the benefits. All PRC ever got for their films was a flat rental rate, no matter how well or poorly the film performed with audiences. (PRC owned a few theatres where they got a better break on their product, but the number of screens – about 10 at most – were so small as to have little impact on the company’s bottom line.) Thus, the margin of profit was very slim. PRC films cost so much, and they made so much; on some of the Westerns, PRC’s actual profit after all the production, exploitation and distribution expenses was as low as $1,000. Because of this, PRC was never really able to expand or move onto more ambitious pictures. Budgets and profits were both strictly limited. My dad [Sigmund], Sam and all their friends left the studio, because Eagle Lion had goals of making bigger and better movies. And my dad said, “You’re making a mistake to change the formula – what we’re doing is very successful.” But the new people who came in wanted to change to “prestige films”, and they did. But they didn’t last very long. Bob Lippert owned three or four hundred theatres up in the Bay area. The reason he got into producing was because he was having trouble buying the pictures from the major studios. He had fights with them and he couldn’t get the shows he wanted. So he got really mad and said, “Okay, I’m coming to Hollywood and produce my own movies”, which he had never done. So he came to Los Angeles and my dad [Sigmund] ended up working with him to do a lot of his movies. But Sam’s attitude towards his work never changed over time. I think he would have probably kept on working ’til he dropped, if he could have. But the old way of doing business was definitely coming to an end; Lippert was the last of the low, low-budget independent producers. was shot at the Sam Goldwyn Studios on the biggest stage that they had there, because they actually built that mountain on the stage. When they designed it, Sam was a part of the process, because he had to shoot it all. They designed it so that they could work their way around the mountain, going higher and higher as they shot the film. The damn thing went almost to the top of the stage. They designed it so they could just work their way around it without having to change the lighting throughout the shoot, and it worked very well. Jack Greenhalgh shot the film for Newfield, one of his last assignments in a career that began in 1935, ended in 1953 and spanned more than 200 films as director of cinematography. Stanley Neufeld worked on the film as an assistant director and remembers that much of the second part of the film was shot at the Santa Anita Botanical Gardens, where, much later, exteriors for the American tele-series Fantasy Island were also photographed. Sam was good making films but didn’t know how to present himself, in today’s market or even back in the ’50s, of being proud of what he was doing, or publicizing it. He just did his work, and didn’t care about publicity or anything like that. And it hurt him, because he never had an agent, never held out for a better deal. He just liked to work more than anything else. He just accepted doing all these program pictures and he never got a real break to do anything better. In the film industry, you get typed. And so working at PRC insulated him from many of the realities of the business, because Sig always handled the business end. On the films he made, if you didn’t do 50 set-ups a day, you were fired, no matter if you were the assistant director or the director. So, Sam really didn’t have the time to be worried. He had to keep working simply to survive. In his final years, Newfield predictably moved over to television, working with his brother Sigmund and Leon Fromkess to create the violently colonialist and racist television series Ramar of the Jungle, starring Jon Hall as a white doctor bringing “civilization” to African tribal culture. Comprised for the most part of stock footage, with hastily staged sequences on a few sparse sets, Ramar was a surprise hit of the 1953/4 American television season, and remained in reruns for many years after; the entire series is now available on DVD. 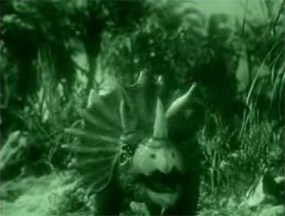 Working at a rapid clip, Newfield directed roughly a third of the series’ episodes, completing each half-hour segment in an astonishing one and 2/3 days, before moving on to direct episodes of Captain Gallant of the Foreign Legion, another 1950s American children’s television show, starring Buster Crabbe, at a similarly rapid pace. By the mid 1950s, however, both Sam and Sigmund were out of step with the industry, clinging to past generic conventions to complete four routine Westerns in 1956 for Sigmund’s newly formed Associated Film Releasing Corporation, which folded in 1957. Newfield accepted a final assignment in Canada, becoming one of the first American directors to produce films there because of the cost incentives. In 1956, he directed 37 episodes of the syndicated television series Hawkeye and The Last of the Mohicans. 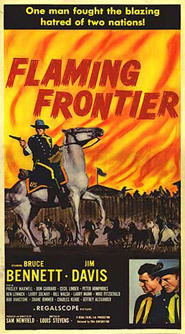 His last theatrical feature productions were Wolf Dog and Flaming Frontier (both 1958), which he shot back-to-back for Regal Films Canada, a subsidiary of Robert L. Lippert’s United States and UK production entities. Both films, shot in RegalScope, a CinemaScope-like widescreen process, were given routine distribution on the bottom half of double bills by 20th Century Fox. With them, Newfield’s directorial career came to a close. I think that the type of films he was doing sort of died out at that point. And so it was hard, very hard getting a job. And he never took care of himself or anything. He never stopped gambling either, which didn’t help the situation. So he ran up like big gambling debts, and my dad [Sigmund] would have to bail him out. He gambled on anything at all. He loved Las Vegas. He loved gambling on sports. It became an addiction. It ruined him. He just couldn’t get work. So he lost a lot of connections. His health was okay until probably the last six months of his life. But he couldn’t get work. And then he got diagnosed with liver cancer. So that was the end of that. Sam Newfield died on 10 November 1964, at the relatively young age of 64. In his last years, he lived in a small apartment two blocks away from Grauman’s Chinese Theatre, supported in large part by his brother Sigmund. Though retired from the business, Sigmund had managed to save enough and invest wisely so that his last years were comfortable; he died on 21 March 1979. Sam Newfield’s daughter Jackie married the owner of a large swimming-pool company, Blue Haven Pools, while his son Joel became a graphic artist for the Los Angeles Times. Sigmund Neufeld’s sons both entered the business. Stanley worked his way up through the ranks and became an executive producer on such films as Come Back, Charleston Blue (1972) and Popi (1978), before retiring in 2006. Sigmund, Jr., had a long career directing episodic television, including episodes of Simon and Simon, Buck Rogers in the 25th Century and Scarecrow and Mrs. King; he retired in 1989 and now lives in Las Vegas. In the end, Sam Newfield’s accomplishments as a director are both ephemeral and yet somehow quite solid. When PRC went out of business, the negatives for the entire PRC catalogue were sold to a television syndicator for a flat $1,750 each, and in the early days of the medium, when the majors shunned television as a threat to their hegemony, Newfield’s films were ubiquitous. In time, the copyrights on all the PRC films lapsed when no one bothered to renew them and the films entered the Public Domain, available for anyone to screen, copy or sell to the public. With the advent of DVDs, Alpha Video, a small American video distributor specializing in copyright-free material, began releasing nearly all of Newfield’s work in cheap, five-dollar editions. So, for better or worse, Newfield’s work is everywhere. With the coming of the worldwide web, downloads of Newfield’s more popular films are now readily available for free, for use on cell phones and video iPods, from a number of archival websites. Perhaps surprisingly, many viewers have a great affection for Newfield’s films precisely because of their compromised origins; films such as Dead Men Walk retain a certain sinister appeal in the grim certainty of their visual execution, while Newfield’s many slapdash Westerns are favoured by aficionados of the genre for their utter disregard of narrative or character motivation; with Newfield, action always comes first. And yet, at the centre of all this activity, Newfield himself remains a remote personality, jocular with his crew, eager to please his employers, yet essentially indecipherable as both a man and the most prolific director in the history of the American sound film. Despite all the films he left behind, Newfield himself is something of an enigma. What drove him to create so much work so quickly? Money, certainly, but there’s more to it than that. Perhaps Sam Newfield was comfortable with himself only on the set, and would rather keep working on anything rather than endure enforced idleness. One could argue that Newfield existed only in his films and that his addiction to gambling was an outlet for his uneasiness with life outside the soundstage. On the set, Sam Newfield knew exactly what he wanted and got it. Offscreen, it seems Newfield searched restlessly for personal satisfaction, which in the end, sadly, remained elusive. What little now survives of his personal life is little more than a few newspaper clippings and two photographs; for the rest, he leaves behind more than 250 feature films. In this, Newfield, one might argue, is the true phantom of the cinema. Dennis Coleman, unpublished interview with Martin Scorsese, 22 March 1991. Wheeler Winston Dixon, unpublished interview with Sigmund Neufeld, Jr., 2 June 2007. _____, unpublished interview with Stanley Neufeld, 3 June 2007. _____, Lost in the Fifties: Rediscovering Phantom Hollywood (Carbondale, IL: Southern Illinois UP, 2005). “Film Baby Walks By Self: PRC Makes Big Strides With More Coin and More Stars”, Daily Variety, 16 October 1944, n.p. Collection of The Margaret Herrick Library, Academy of Motion Picture Arts and Sciences, Los Angeles. “Film Merger Plan Revealed: PRC to Combine with Another Company”, Hollywood Citizen News, 3 August 1944, n.p. Collection of The Margaret Herrick Library, Academy of Motion Picture Arts and Sciences, Los Angeles. Charles Flynn and Todd McCarthy, “The Economic Imperative: Why Was the B Movie Necessary?”, in Kings of the Bs, pp. 13-47. “Fromkess Elected PRC President”, Motion Picture Herald, 22 July 1944, n.p. Collection of The Margaret Herrick Library, Academy of Motion Picture Arts and Sciences, Los Angeles. “Increased Film Budget Planned for PRC Product”, Motion Picture Herald, 31 June 1942, n.p. Collection of The Margaret Herrick Library, Academy of Motion Picture Arts and Sciences, Los Angeles. “Jean Beutier Wed to Joel C. Newfield”, Los Angeles Times, 29 November 1973, C10. Collection of The Margaret Herrick Library, Academy of Motion Picture Arts and Sciences, Los Angeles. “PRC Announces Takeover of Major Indie Producer: Reveals Theater Ownership”, Daily Variety, 3 August 1944, n.p. Collection of The Margaret Herrick Library, Academy of Motion Picture Arts and Sciences, Los Angeles. “PRC Has Growing Pains: Record Year Marked by Five Forward Steps”, Daily Variety, 29 October 1943, p. 489. Collection of The Margaret Herrick Library, Academy of Motion Picture Arts and Sciences, Los Angeles. “PRC Pictures Plans National Distribution”, Motion Picture Herald, 5 February 1944, n.p. Collection of The Margaret Herrick Library, Academy of Motion Picture Arts and Sciences, Los Angeles. “PRC President Outlines Company’s Expansion Plans”, Hollywood Reporter, 3 August 1944, n.p. Collection of The Margaret Herrick Library, Academy of Motion Picture Arts and Sciences, Los Angeles. “Vote Today on 15 Million Combo of Pathé and PRC”, Daily Variety, 24 June 1944, n.p. Collection of The Margaret Herrick Library, Academy of Motion Picture Arts and Sciences, Los Angeles. A complete filmography of Newfield’s feature films, with the short films appended as a separate list, can be found at Neil Roughley’s website, “The Films of Sam Newfield”. In addition to DVDs of Newfield’s films from Alpha Video and other distributors, free downloads of a number of Newfield’s feature films can be found at the Internet Archive. See Jack Backstreet, “Biography for Ben Judell”, 31 May 2007, for more details on this. Peter Bogdanovich, “Edgar G. Ulmer Interview”, in Todd McCarthy and Charles Flynn (Eds), Kings of the Bs; Working Within the Hollywood System (New York: Dutton, 1975), p. 397. McCarthy and McCarthy, p. 41.